As expected, European Central Bank (ECB) president Mario Draghi’s visit to Lisbon on Thursday 7th April was welcomed with protests. First at Palácio de Belém (the official presidential premises), and later that day at Largo de São Domingos. 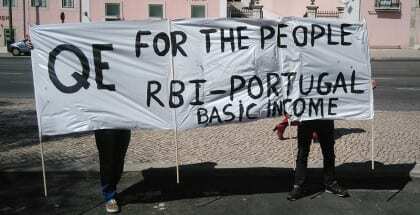 A few dozen protesters were present, answering a call from the political party Bloco de Esquerda, as well as activists from Basic Income Portugal, who held a banner with “QE for the People” written on it. “QE” stands for Quantitative Easing, which designates the ECB’s stimulus programme by which it injects 60 billion euros per month into financial markets. As a reaction to this programme, more and more are defending the alternative idea of “QE for the People” which is being promoted by a coalition of organisations across Europe. The idea basically consists in redirecting the ongoing money creation of the ECB towards the real economy, for instance as a citizens’ dividend. Protests have been spurred around the ECB’s QE policy because it has exclusively benefited the financial system (mainly banks), and not those more in need of it, the general population. Draghi has shown an interest in the policy of “QE for the People”, as if money was being (metaphorically) thrown out of a helicopter. However, no such policy has yet come to be, and it would, in effect, mark a reversal of all past ECB monetary policy. Draghi was invited to Lisbon by the recently elected President of Portugal, Marcelo Rebelo de Sousa. Rendimento Básico Portugal Facebook page.